Working as an intern at Looker taught me many things, from basic dashboard usage to complex analytic terminology. While most of what I picked up was from hands-on daily tasks, I was struck by what I learned about data by simply listening to the people all around me. I came to realize that there was a pattern to the questions repeated by fellow-Lookers on the marketing, sales, and sales development representative (SDR) teams. “Where can I find content about customers using Looker for marketing analytics?” and “Do we have any shareable content for healthcare analytics?” were among the most common queries. It quickly became clear to me that this type of information is very important in the daily roles of many people, across departments. My mentor, Kelly Payne, and I discussed the apparent need and decided that a solution to many of these questions could be found in the creation of a smaller database, specific to the needs of the marketing, sales and SDR teams. Gather all the data needed to answer questions regarding customer content location and content type. Create a repository that is easy to update, integrates with other systems, and can grow with the company. Knowing that a customer content database would be heavily-utilized by the sales, marketing, and SDR teams, I interviewed Lookers from each of these departments to better understand their needs before creating the tool. All three departments had a need for finding content that they leverage as value-add proof points in their roles. Additionally, each team shared what they thought would make the most sense when tagging and bucketing pieces in a content database. Technology Mentioned - Groups content by mentions of an ETL tool or certain databases such as Snowflake, Amazon Redshift or Google BigQuery. Target Audience - Refers to the personas that content is written for such as CTOs, data analysts, operations, marketing analysts, etc. Business Value - Buckets content by type of value gained by customers such as ROI, time optimization, increased supply chain efficiency, etc. A database is useless without trackable data. So, with a complete table holding our compiled customer content, it was time to tag the content. This included creating summary descriptions, categorizing (or ‘tagging’) these descriptions, and recording any valuable, useable customer quotes. The results were well worth the investment of time. With the categorized raw data alone, it was now possible to narrow down and search for specific pieces of content; whether it’s a bit of content about how a customer’s marketing team uses Looker, or it’s information catered towards a Director/VP level audience, or both. Even in this unfinished format, I was pleasantly surprised to find that I was able to help a teammate with a specific project. Best of all, with this new database we were creating, finding the answers we needed took only minutes instead of the hours it might have taken to sort through numerous customer videos. Once all of the included data was tagged, the next step was to moving the data into Looker. The data was moved into Google BigQuery, which allows Looker to connect and manipulate the data. In addition, our Salesforce data was joined to the content database, which provides tags for several categories (including Segment and Industry). There were a few minor issues with unnesting the data, but after learning SQL and leveraging LookML, the data was complete and fully usable! 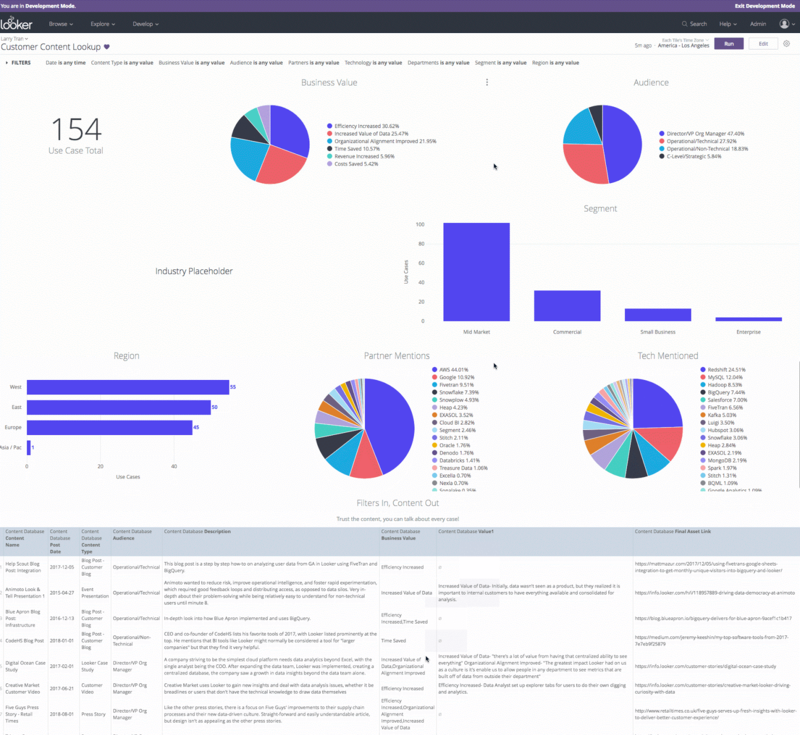 All the information was now queryable on Looker and I was then able to create two special dashboards: the Customer Content Analytics Dashboard and the Customer Content Lookup. Looker presents the data in dynamic visualizations, providing easy-to-read insights so content creation can be easily observed by anyone from any department, to find the content they need by filtering with any category. Best of all, the new database can scale with the company! As more content is created, it can be added with relative ease with a simple form and long-term trends can be observed as it grows. After signing off with the stakeholders and my superiors, the new database was ready for release. There are small intricacies with the Customer Content Lookup that may leave users confused. To address this potential issue, I documented how to effectively use the Lookup and sent it out on Slack. Additionally, it was embedded on our internal employee site for better visibility and access. In terms of defining success, there are two measures that can prove whether my project made a difference. If there is a decrease in questions about customer content or finding it, then the project is a success, since it means I, and many others, spend less time answering those questions. The second measure is an increase in customer content use across the marketing, sales, and SDR departments. While it is too early to determine the project’s success, it can become the staple tool for finding content. The Takeaway: Was It Worth Creating a Content Database? While tagging content may seem like a tedious task, it became immediately clear that several hours of time can turn into hundreds of hours of saved time across departments. This project was well-worth the endeavor, because I learned how Looker can be used across multiple industries and how valuable data has become in this digital age. In other words, what was the most valuable lesson I learned from this experience? Leverage your data, make it more accessible, and become data-driven.